A group of area farmers, with interest and foresight for our community, are responsible for the beginning of our growing organization. It was on May 27, 1916, that the Articles of Incorporation was signed for "THE FARMERS GRAIN AND LUMBER COMPANY" of Dacoma, Oklahoma. It began with a capital stock of $5,000.00, to be divided into 500 shares of $10.00 each. The Directors or Trustees signing were: O.L. Glasgow, C.F. Stoner, Alexander Davis Sr., F.N. Smith and A.H. Frye. On April 20, 1918, there was a change of Certificate of Incorporation, Charter, Stock and Name. The new name was "FARMERS MILLING COMPANY OF DACOMA," and the capital stock was raised from $5,000.00 to $10,000.00. This charter was signed by O.L. Glasgow, M.E. Frazier and E.B. Bergner. The long remembered flour mill was built in 1918 at a cost of $14,000.00. Families and farmers came from miles around for the purpose of both marketing and purchasing that flour under the trade name of "THE PRIDE OF DACOMA." 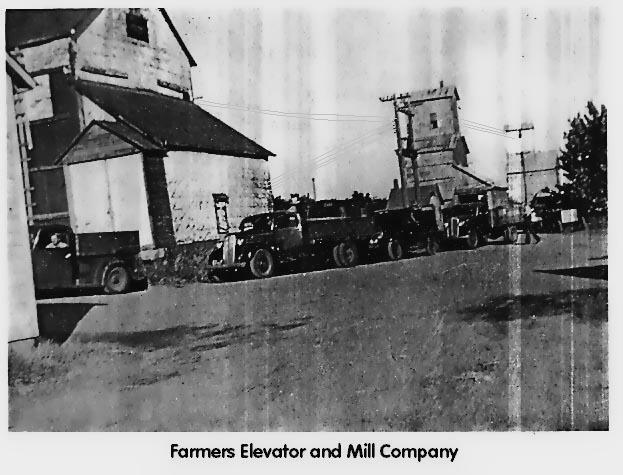 With this background and continued vision, "THE FARMERS ELEVATOR AND MILL COMPANY" was born and chartered February 3, 1920, by these dedicated pioneers. Authorized capital stock was $35,000.00. The first board of Trustees of this present Cooperative was: O.L. Glasgow, president, with C.F. Stoner, H.F. Glasgow, F.N. Smith and J.R. Tallman, members. The purpose of this organization from the beginning was to serve the best interests of its membership and entire community. We bring this quote from our original charter for your edification: "The purpose for which this corporation is formed is to buy, sell and store grain and other products. To sell oil, lubricants, gasoline and to carry on general merchandise business." Through the years it was feasible to drop some products or add others, but basically, the policy has always been the same - to meet the needs of the community. This first year found the new cooperative without facilities but certainly not without the ability and perseverance to overcome the problems. Milt Purdy pitched a tent for his housing and he proceeded to weigh the wagons of grain on the old wagon scales. The wagons were then unloaded by hand directly to the boxcars. The first elevator was a small frame structure to the west of the present office building. During these infant years, growth was slow due to the small crops and earnings, but the elevator was always geared to expansion. Roy Jansen came to be the first Manager. Guss Heady became Manager in 1927 and had the longest tenure of service in such capacity of any Manager throughout the area. He was to complete 38 years of efficient, profitable service to "The Farmers Elevator and Mill Co." Through the years, Guss not only won the respect and admiration of his local community, but fellow-Cooperative Managers, Grain Dealers and associates of the region. His friendly unassuming manner, stability, integrity. and sound wisdom were held in deep regard by all. 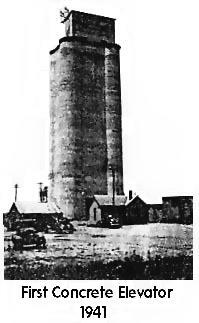 The first concrete elevator was constructed in the year 1941 at a cost of $27,700.00 by Roberts Construction Co. with a 100,000bu bushel storage capacity. This was the north section of the west elevator. On March 12, 1945, it was voted by the Board to build a new office building. This was just west of the present building. Business was now increasing and also the need for additional storage. A second concrete elevator was built in 1948 as an annex to the south of the first, west elevator. This was built at a cost of $52,000.00 by Roberts Construction Co., increasing storage another 100,000 bushels. In 1949, the authorized capital stock was raised to $100,000.00. The steel building housing the wheat cleaner and feed storage was built in 1950 for $8,000.00. Continuing united efforts of management and membership saw another expansion necessary. In 1954, following a vote of the stockholders, the contract was signed with Tillotson Construction Co. for a new 250,000 bushel concrete elevator. This new one to be located to the east of the office at a cost of $138,971.00. In 1956 the Authorized Capital stock was raised from $100,000.00 to $600,000.00. On January 12, 1966, George Milledge came to serve as our Manager for the next four years. It was also during this year that the new fertilizer and anhydrous building was built and stocked as a new enterprise.